Adam has found the perfect show to binge for those both young and young-at-heart in Alex Hirsch’s wonderful Gravity Falls. The series is being released in a massive, in-depth Blu-Ray Collector’s Edition from Shout Factory. The genius of Alex Hirsch’s Gravity Falls is not in its mile-a-minute references to everything from Twilight Zone to Indiana Jones to X-Files to Stephen King to Fulci to Amblin to David Lynch. The show’s genius is in its heartfelt message of family, discovery, intelligence, and being your own self. Over the course of 40-episodes, the show manages to be on the sly its influences, never making those its thematic substance. Gravity Falls is successful because of its emotional core and sublime character and story work. 12-year-old Twins Dipper and Mabel Pines are left in the care of their Grunkle Stan (or Great Uncle for those not in the know) for their Summer Vacation. Grunkle Stan runs The Mystery Shack a sort of Bazaar/Tourist Trap in Gravity Falls, Oregon (No need to consult your friend Google. I already did. No real Gravity Falls, Oregon). 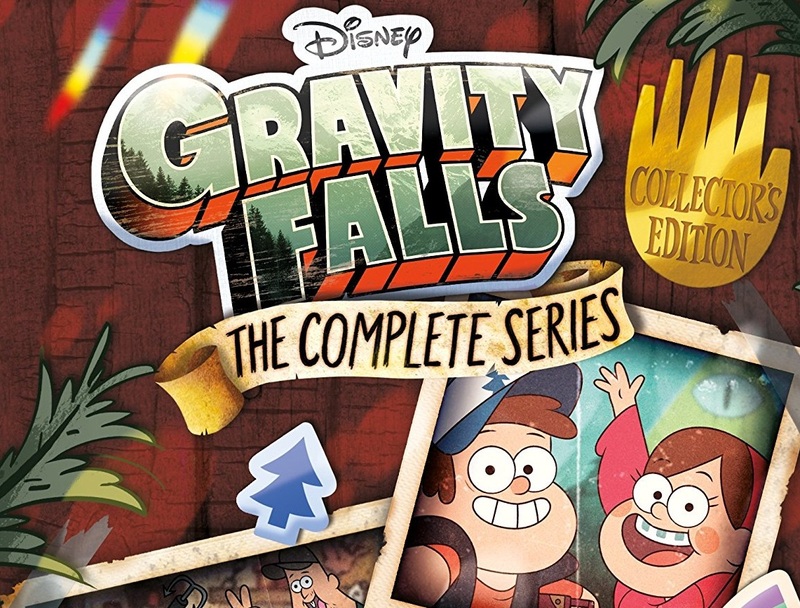 Over the course of one long summer Dipper and Mabel with the help of friends like Soos, and Wendy they begin to unravel the mystery of Gravity Falls and possibly save the small town and the entire universe. Each episode has the Pine twins coming in contact with all manner of imps, demons, and the like that are connected to a larger mythology that unfolds over the two seasons of the show. There is heavy inspiration from the Amblin films of the 80’s as well as Twilight Zone/X-Files to be sure but the show is adroit enough to leave it as just inspiration. Hirsch and the writer’s secret weapon is the relationship between Dipper, Mabel and the cast of characters that inhabit the small town. Dipper and Mabel are the heart of the show. Unlike many stories about brother and sisters, the Pine twins have a happy and functioning relationship. The beauty of the show is how it reinforces and promotes teamwork and cooperation not only between siblings but the world writ large. Even in dealing with Gideon, the child evangelist straight out of a King Novel, Dipper and Mabel try to find an amicable way to resolve the issues. The twins are never out to destroy anything, their natural curiosity seems to get them into trouble (trouble sometimes finds them) and it’s their brains, know-how, and compassion that help resolve the issues. Gravity Falls is the type of show that rewards with repeated viewings. Hirsch and his team of writers and directors have created a show that isn’t simply resting on the shoulders of giants. They push themselves to be bold with their storytelling. Though references are embedded into the storytelling, every episode feels fresh and unique. Episodes dealing with such clichés as Time Travel, Mermen, Dungeons and Dragons, Boy Bands, and Zombies are freshly humorous. These aren’t simply troupes the writers are using to entertain but each of these becomes a greater part of the whole within the tapestry that is Gravity Falls. Many series as of late have pulled strongly towards the Amblin style of 80’s “kid’s on an adventure” storytelling, most miss the point. Gravity Falls learns the right lessons and builds its characters, storylines, arcs beautifully expanding the world and the larger story they are telling. The show isn’t merely an episodic venture but a full-blown serialized mythology. The larger story growing bigger and darker as they show continues. It brilliantly subverts modern expectations of mythology by giving us classic mythology but done so with such understanding of how this type of story is built. That understanding always has the series at least a half step if not a full step ahead of your expectations. One is hesitant to reveal anything beyond minimal details regarding the how’s, and why’s of Gravity Fall’s end game. If one that has concerns about the show’s ability to “land its ending”. Do not, it does and with the sort of grace and style that few shows have been able to do. One will be shocked and delighted at how Hirsch and the team of writers are able to toe the line of family entertainment and truly mature storytelling. Alex Hirsh learned the right lessons from creatives such as Stephen King, Steven Spielberg, and Rod Serling. Gravity Falls is as confidently told genre filmmaking as this reviewer has ever seen. With a rich and deep mythology and richly drawn characters, the show is emotional, funny, fun, interesting and dark. It takes what is possible in the TV Narrative form to its limits. The show is more than the confluence of influential storytelling. Gravity Falls is simply perfect narrative storytelling. Shout Factory has gotten pristine beautiful transfers from Disney for this Blu-Ray release. The transfers for the entire 40-episode run are perfectly graded and color corrected. There is a definite uptick in quality from the Broadcast and Streaming versions of the show. Encyclopedic. That’s the word of the day ladies and gents. Shout Factory and their content producers have gathered together an ENCYCLOPEDIC amount of special features to this disc. Spread over seven discs, that includes a single Blu-Ray devoted to just extras, the work they have done here is exhaustive, to say the least. The commentaries on all 40-episode hosted by Creator Alex Hirsch give you anything and everything you would want to know about the show. The commentaries are fun, an informative 22-minutes blast of information. It seems like every cast and crew member participated in this epic venture. Warning though, they do give away spoilers throughout the commentaries. One Crazy Summer is a behind the scenes documentary at the making of Gravity Falls. The 105-minute doc goes over everything and anything you would want to know including meeting the inspiration for the best character of the series, Mabel (drawing from his own life it’s actually Hirsch’s own Twin Sister Ariel). Like most Shout Factory making-of docs they seem to have included everyone from Hirsch to actors Jason Ritter and Kristen Schall to Composer Brad Breeck (try to watch a few episodes and not get the great-great theme music stuck in your head for three weeks) to participate. The Hirsch Twins is an interview between Alex and Ariel Hirsch about their summers growing up and the similarities and differences from the show. Between The Pines is a 22-minute behind the scenes featurette about the making of the Series Finale. This seems like a Disney XD Channel produced content. It is a bit on the glossy side but its informative none-the-less. They’ve included 65-minutes of deleted scenes, mostly in rough cut form. This feature will be of interest to Animation fans and student giving them the context of how and why the cutscenes for animation. Finally, they included some Shorts and Promotional material. The shorts were small webisodes (seen on Disney XD’s Website) that bridge the gap between season 1 and 2. The promotional material is everything from TV Spots, 15-second intersals, and everything else they used to promote the show. Gravity Falls is as entertaining as TV Shows come. Shout Factory has hit a Grand Slam with this one. The extras Shout Factory has put together are nothing short of perfect. This is Year End Top 10 Box Set Material. HIGHEST POSSIBLE RECOMMENDATIONS!!! !